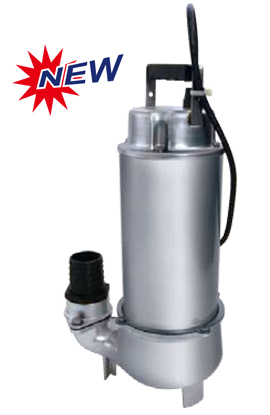 AS-208 and AS-215 stainless steel sewage pumps for industrial, commercial, municipal, and residential applications. Outlet – 50 mm (2 in.). AS-208: 14 m / 49 ft., AS-215: 18 m / 59 ft.
AS-208: 360 l/min / 95 gpm, AS-215: 460 l/min / 122 gpm. Oil free motor, 1 & 3 phase, with thermal / over-current protector. Constructed entirely in stainless steel: motor cover, motor frame, impeller...all in stainless steel. Standard cable length – 6 m (20 ft) or longer upon request. Tethered float switch is available upon request – AS-208A and AS-215A.